Nail fungus treatment is very important. The sooner you begin treatment the better. If left untreated, nail fungus can become very painful and unsightly. Unfortunately many people ignore nail fungus until the symptoms worsen. It is estimated that three to five percent of the population suffer from nail fungus. Most often, nail fungus appears in the toenails. This is because socks and shoes keep the toenails dark, war, and moist. This is a perfect place for the fungus to grow. Before discussing the best nail fungus treatment, we will go over what nail fungus is, and how to prevent it. Nail fungus (also called onychomycosis) is made up of very small organisms that can infect fingernails and toenails. These organisms are called dermatophytes. Fungi are parasitic plant organisms, such as molds and mildew. These parasitic organisms lack chlorophyll and therefore do not require sunlight for growth. Nail fungus is very common. More than 35 million people in the US have it under their nails. Once the nail fungus moves in under the nail, it is difficult to reach and stop. The nail provides a safe place for the fungus and protects it while it grows. This is why basic prevention is so important. Nail fungus can sometimes spread from one person to another. These organisms can live where the air is often moist and people’s feet are bare. Common places that fungus can spread include: shower stalls, bathrooms, or locker rooms. It can also be passed along when you share a nail file or clippers with someone who has a nail fungus infection. Nail fungus may also spread from one of your nails to others. The fungal organisms that cause nail infections are present almost everywhere. Once they get under the nail bed they can be difficult to cure. Anything that damages a nail can make it easier for the fungus to move in. Examples include an injury to the nail such as getting a finger stuck in a door, or tight shoes that pinch the toes. A weakened immune system can also make it easier for a fungal infection to start. Many medical professionals believe that having a strong immune system is essential for preventing fungus infections. By following common sense precautions, including proper hygiene and regular inspection of the feet and toes, the chances of the problem occurring can be sharply reduced, or halted. Wash your feet regularly with soap and water. Remember to dry your feet thoroughly after washing. Properly fitted shoes are essential; an astonishing number of people wear shoes that don’t fit right, and cause serious foot problems. A shoe with a firm sole and soft upper is best for daily activities. Use a quality foot powder — talcum, not cornstarch — in conjunction with shoes that fit well and are made of materials that breathe. Wear socks made of synthetic fiber, which tend to “wick” away moisture faster than cotton or wool socks, especially for sports activity. Disinfect home pedicure tools and don’t apply polish to nails suspected of infection. Signs of an infection include toes that are red, discolored, or swollen. With proper prevention, your chances of getting a nail fungus are greatly reduced. If you do develop a fungus, you must start a nail fungus treatment before the condition worsens. We will now go over the best nail fungus cure. One of the biggest mistakes we see in nail fungus treatment is trying a home remedy for nail fungus. Many patients spend months trying treatments like vinegar, bleach, rubbing alcohol and even Listerine. Unfortunately except in rare cases, these home remedies don’t work. And since you are wasting time trying them, your fungus can actually worsen. 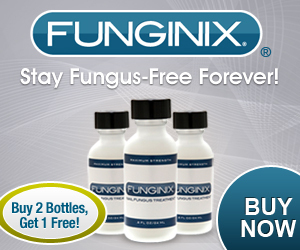 Funginix contains the best combination of anti-fungal agents, essential oils and fungus-fighting extracts proven to get rid of nail fungus. Find out more here!